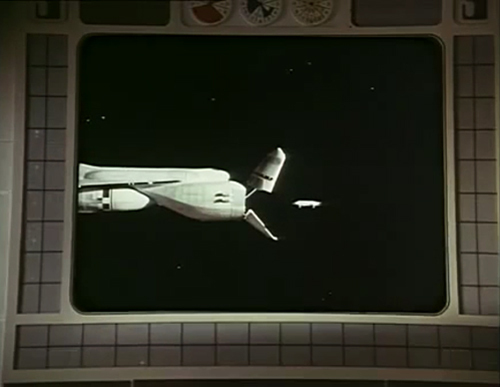 But there is an explanation, metaphysical though it may be, that is offered in two first season (1975-6) episodes, "Black Sun" and "Collision Course". The nuclear explosions that should have destroyed or at least fractured the Moon were by fluke of chance or perhaps by design of a deity or of some other metaphysical, spiritual force, instead harnessed to blast the whole Moon out of Earth orbit. 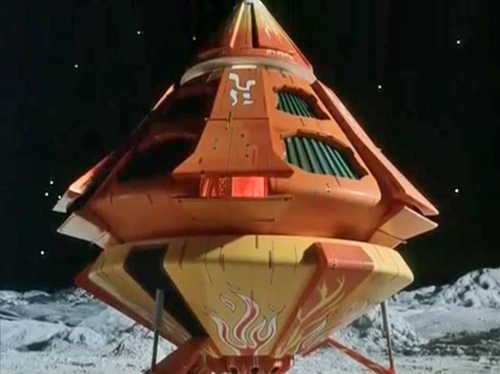 And to act like a "gigantic rocket motor", propelling the Moon away from Earth at such a speed that evacuation from Moonbase was not feasible, requiring the Moonbase Alphans- or Alphans, for short- to remain on the Moon as it drifts through space, putting them in contact with various alien worlds and races. 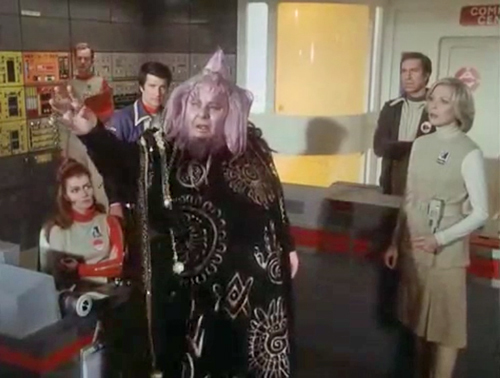 This explanation is raised in "Black Sun" by Alpha's senior scientist and resident philosopher, Prof. Victor Bergman (Barry Morse), and seemed to be affirmed by the aged alien Queen Arra in "Collision Course". 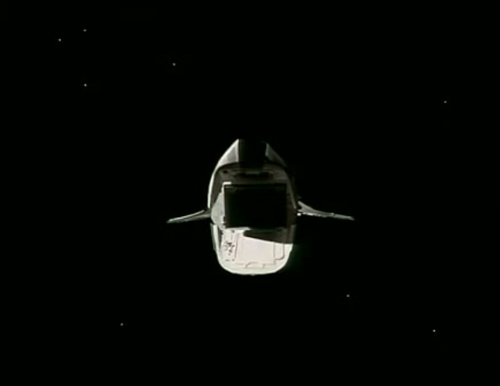 The event of the Earth-orbit-breaking blast, though seemingly caused by human shortsightedness, ostensibly was destined to happen, manipulated by some "cosmic intelligence" to occur, so that the Moon and its inhabitants could be physically separated from Earth, to foster a brave, new phase in man's existence and in the existence of other races, to act as an agent of a higher power by restoring life to dead planets, impressing upon- or attempting to impress upon- corrupt aliens a live-and-let-live and help-those-in-need moral code, and surviving peril after peril with bravery, fortitude, dignity, and hope. With this explanation, scientific laws can be bent or overridden, to enable Moonbase Alpha to move about the cosmos to effect positive change. 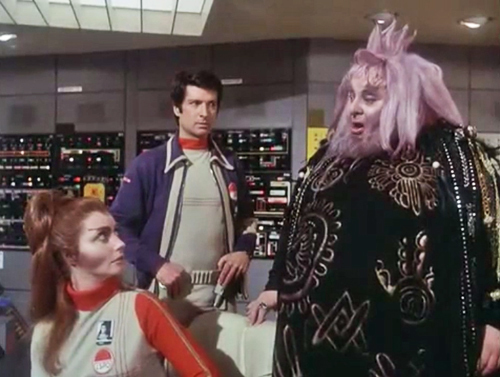 Whether the Mysterious Unknown Force (as the writers of first season episodes have called it) actually is God or a profoundly evolved alien intelligence somewhere in space intervening with purpose, or perhaps spiritually ascendant ancestors or kith of Earthman, is left to the people of Moonbase Alpha and thence the viewer to ponder and to postulate. "Collision Course" is decidedly metaphysical in its plot-line. In watching that episode again, I noticed details that reinforce a more esoteric analysis. In particular, John Koenig has to literally pierce the veil to interact with Arra. In fact, he must address a series of veil images before he is able to see the face of this god-like being. 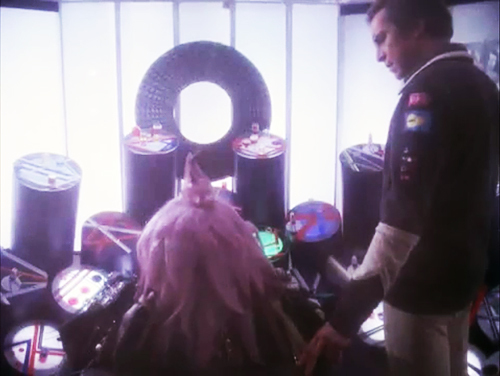 I also thought it was interesting that he was pulled into a ship that looks distinctly like whale, to have audience with Arra, who talks to him about cosmic destiny and tells him what he must do. It then spits him out so that he can go tell this bizarre prophetic tale to the crew and warn them that the course of action they're on is the wrong one. That John is Jonah seems a fair deduction. There are a number of metaphysical plot twists and deus ex machina solutions that come up, in the course of the series. "The Taybor," however, wins the prize for a symbolic complexity that underlies its rather pedestrian plot. 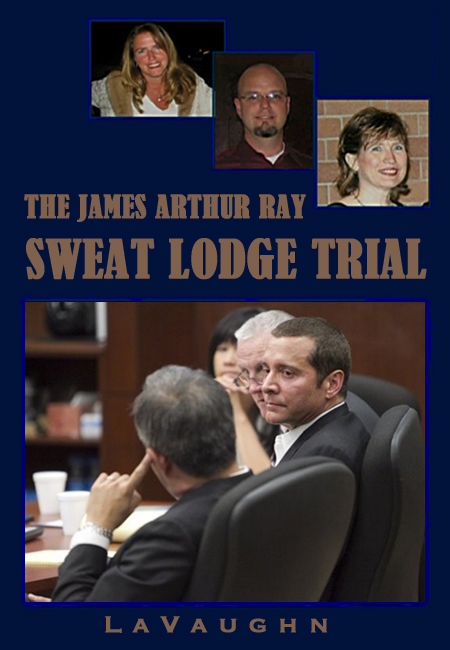 The first clue to the underlying meaning of the episode is the name. Tradition long held that Mount Tabor was the site of Christ's transfiguration, although that has more recently become a subject of some dispute. I was also struck by an allusion to key sacred geometry in Taybor's explanation of his origins and how he has come to traverse space. Sixty-eight parsecs from the notorious Frontier Worlds of Shmagod, on the Inner Vesica Route. [emphasis added] You may well wonder at my humble origins, and how a lad from Pinvith the Lesser has dragged himself two hundred thousand parsecs from the wrong side of a dusty world, on the wrong side of the wrong galaxy in the wrong Universe, to haul himself up by the graviton straps, so to speak, heh, heh, and to venture forth in search of beauty, beautiful things, beautiful people. I have written a good deal about the significance of the vesica piscis, most specifically here. What I find interesting in this case, though, is the combination of symbols. 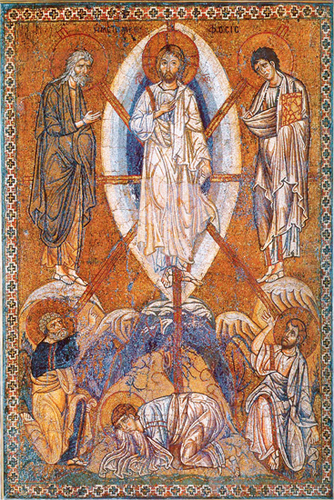 Vesica piscis is also the shape of the mandorla, the almond-like opening in which Jesus appears in many depictions of his transfiguration on Mount Tabor. 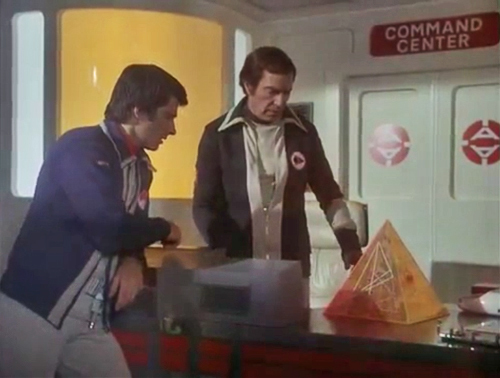 Taybor heralds his impending visit to the Alpha Station with gifts that materialize out of thin air in odd locations around the site. The first appears in the Solarium, a recreational area for employees to bathe in artificially generated sunlight. The first gift to appear is in that Mt. Meru shape that I addressed here. In this article, William Henry delves into Mt. Meru/wormhole mythology and its association with the Holy Grail. 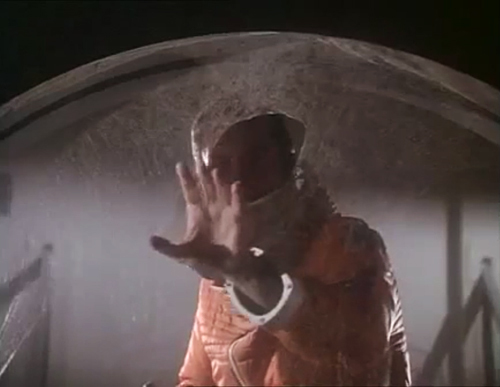 It's hard to miss the association between stargate technology and this introduction to the character of Taybor the trader, who travels invisibly and instantaneously through hyperspace. A gold strand coils up around its scaly, serpent skin appearance. Although, it's never really explained what this object is supposed to do, it temporarily blinds a woman with flash of blue flame. There is a lot going on in this brief scene. A woman picks up a deceptively simple looking box, but she is actually interacting with one of the great mysteries of the universe. The result is the physical blindness of the soothsayer. She has seen beyond the illusory, material world. Throughout the scene, the women in this recreation area are all putting sunglasses on and taking them off, distancing themselves for moments at a time from the artificial reality construct, much like Neo, Trinity, and Morpheus, when they enter The Matrix. Meanwhile, a different character picks up another of Taybor's gifts. He falls into a deep trance and collapses to the floor. Later Taybor explains the problem. This item is a "memory amplifier." Touching it would help a person find misplaced items, but picking it up overwhelmed the young man in a lifetime's worth of memories. The geometry of this box is hexagonal, another form associated with interdimensional travel. 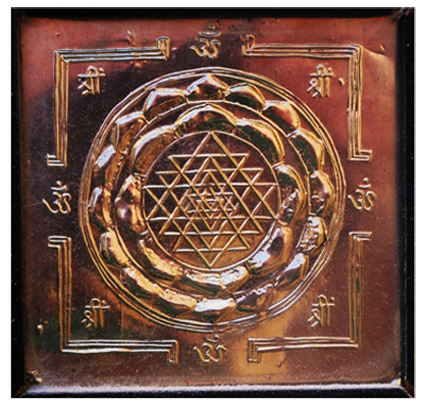 The merkaba is a an activated star tetrahedron – a three-dimensional, stellated hexagon. We can see another nod to this hexagonal form on Taybor's elaborate robe. 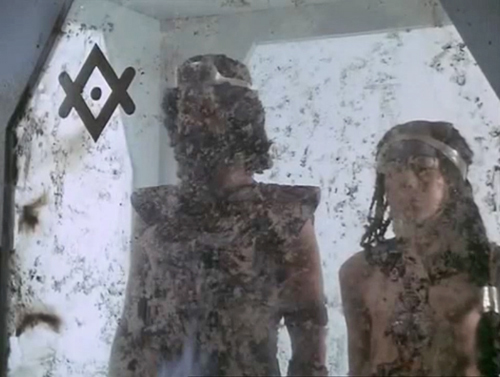 It's a symbol we've seen in the show before, described as a warning of danger, in "The Mark of Archanon." 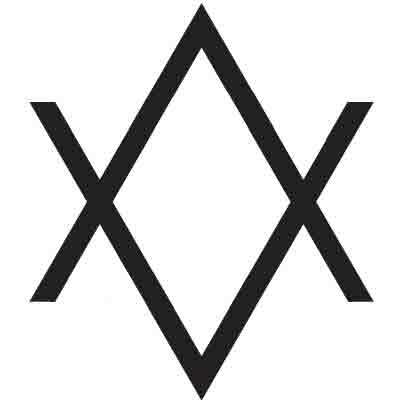 It's a Star of David – two dimensional star tetrahedron and probable symbol of the Merkavah – minus the two horizontal lines. Taybor's robe, which makes him look like the quintessential wizard, is covered with golden symbols. There is, for instance, a symbol of a hand with an activated chakra in the palm. It seems appropriate given the amount of control over matter he can exert with simple hand gestures. Much of it looks like solar symbolism, especially the very large image, above the hand, of a circumpunct surrounded by the sun's rays. 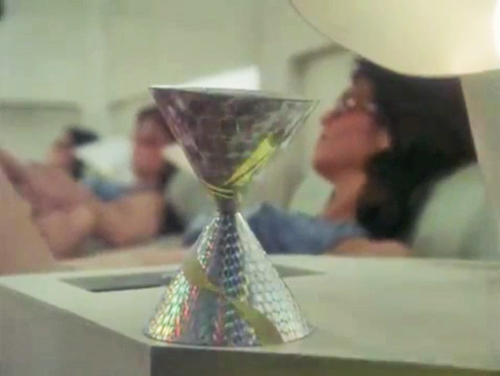 The entire episode is replete with circumpunct imagery. As I noted in my original post on "The Taybor," the jump drive that allows him to travel through hyperspace is a circumpunct. The Emporium has circumpunct imagery throughout Taybor's art collection. 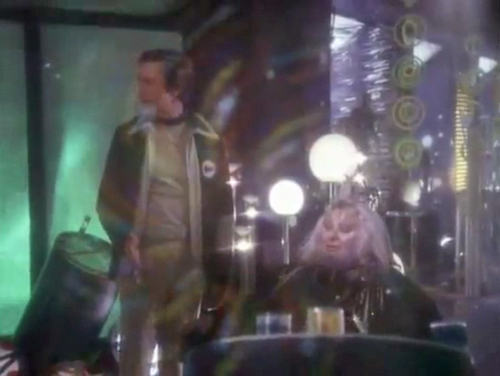 Such images can be seen in the background as he takes Koenig into the rainbow lit world of hyperspace. The necklace he gives Maya before transporting her onto his ship is also an elaborate circumpunct. The mythic structure of "The Taybor" is a mixture of Eastern and Western symbolism. 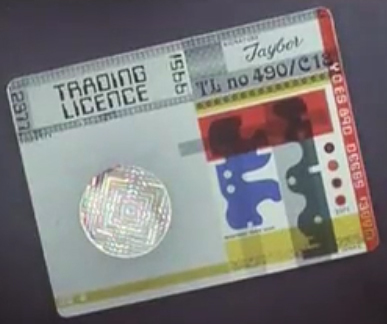 For instance, Taybor's trading license has a holographic seal, which looks very like a Hindu Yantra. Taybor's ship, the SS Emporium, is a study in kundalini imagery. The base is decorated with flames and near the top is writing that resembles Sanskrit or one of the Brahmi scripts. 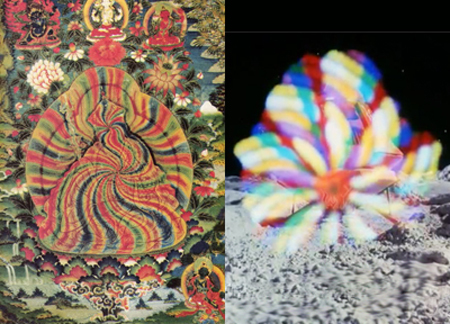 As discussed, when the ship shifts into hyperspace, it looks very like the Tibetan rainbow body. The ship is conical suggesting vortical movement of some kind. 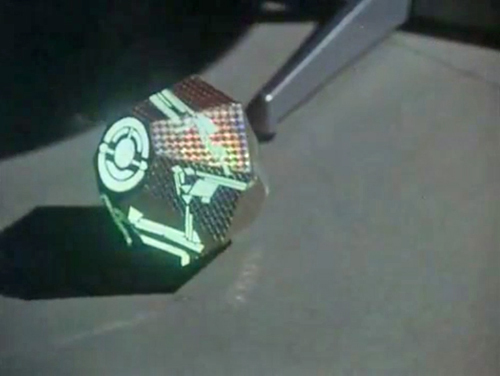 The diagram for the jump drive Taybor provides is pyramid shaped. For a deeper exploration into the cone shape and its association with the pyramid, see here. So, I really underestimated just how much I'd underestimated this show. "The Taybor" is a blueprint of ascension technology. And while both the production values and the symbolic artistry have been eclipsed by shows like the new Doctor Who, there is alchemical gold to be mined in some of these episodes. 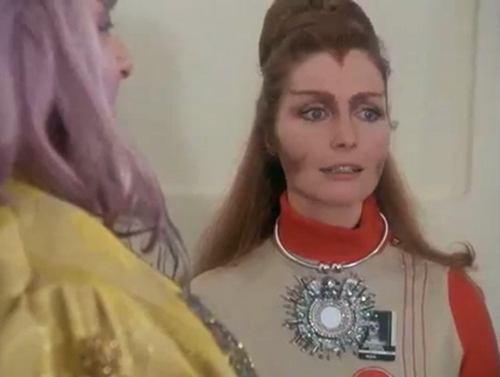 Both seasons of Space 1999 are currently available for free viewing on IMDB and most if not all of the episodes can also be found with a little digging on YouTube.